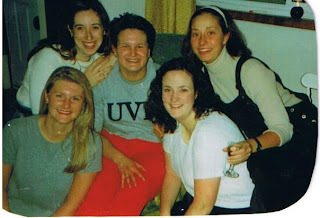 Ang and I in our apartment back in the day with a few other good girlfriends! Congrats on the new blog...I'll be checking it out! Also, I was in Victoria for school too...me at Camosun and my sister at UVIC! Great times in that city!! Thank you for the introduction!! I shall head there next. It's so nice to see bloggers being encouraging and supportive of one other. So many wonderful folk in the food blogging sector, and you, my friend, are among them.